University of North Carolina Press, 9781469635033, 240pp. In 1932, the city of Natchez, Mississippi, reckoned with an unexpected influx of journalists and tourists as the lurid story of a local murder was splashed across headlines nationwide. Two eccentrics, Richard Dana and Octavia Dockery--known in the press as the "Wild Man" and the "Goat Woman"--enlisted an African American man named George Pearls to rob their reclusive neighbor, Jennie Merrill, at her estate. During the attempted robbery, Merrill was shot and killed. The crime drew national coverage when it came to light that Dana and Dockery, the alleged murderers, shared their huge, decaying antebellum mansion with their goats and other livestock, which prompted journalists to call the estate "Goat Castle." Pearls was killed by an Arkansas policeman in an unrelated incident before he could face trial. However, as was all too typical in the Jim Crow South, the white community demanded "justice," and an innocent black woman named Emily Burns was ultimately sent to prison for the murder of Merrill. Dana and Dockery not only avoided punishment but also lived to profit from the notoriety of the murder by opening their derelict home to tourists. 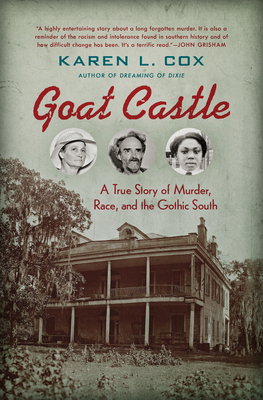 Strange, fascinating, and sobering, Goat Castle tells the story of this local feud, killing, investigation, and trial, showing how a true crime tale of fallen southern grandeur and murder obscured an all too familiar story of racial injustice.